June has been a cool month so far and is on target to be the coolest June since 1991, or certainly close. It has also been dry with just 28% of monthly rain so far for SE England. 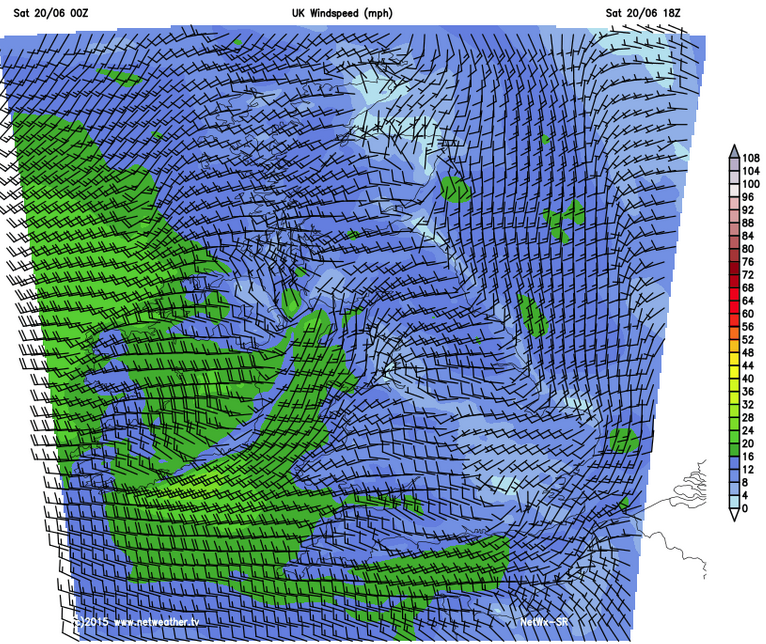 Of interest are surface winds which appear to converge in a zone, associated with a cold front, across the south later today (spot the twisty wind barbs below): convergence is where winds arrive quicker than they leave a region and, as winds “pile up”, this often promotes LIFT (upward air motion) that encourages convection and storms. But it’s a slack scene and by no means a classic stormy picture. Scattered slight risk of heavy showers is likely to be about it. Skew-t charts (cross-sections through the atmosphere showing temperature, wind speed, direction and humidity etc) also show reasonably high CAPE >600j/kg (convective available potential energy) and some negative lifted index in central southern England. These values are indicators of instability: which means air is free to rise to a great height, condense into tall clouds possibly forming cumulonimbus. Note the change of wind speed with height, such wind shear also acts to duct air from the surface. Well, the ingredients are there for heavy showers later today but they were also present in the much heralded plume last week and that came to nothing, catching out professional forecasts as well as amateur enthusiasts. 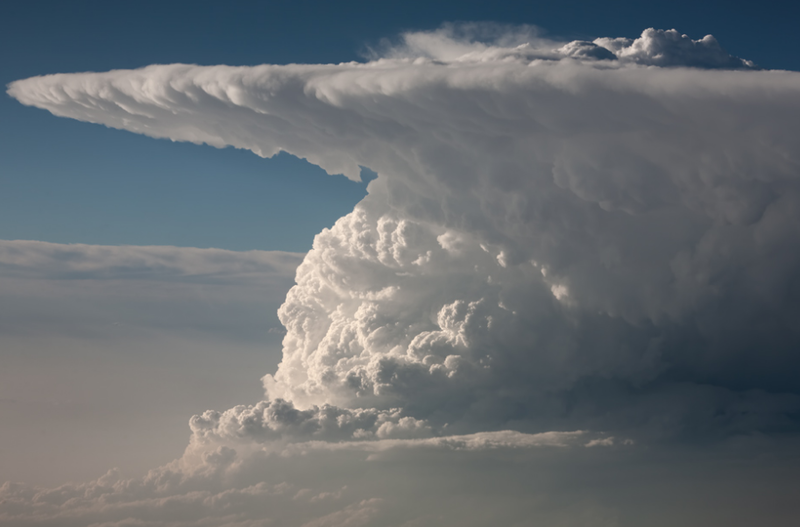 There were a few notable heavy thundery outbreaks last week but many convective forecasters and storm enthusiasts were stung by the lack of activity and model predictions appeared to founder. The scenario today is decidedly less “stormy” so storm fans should not get excited either! 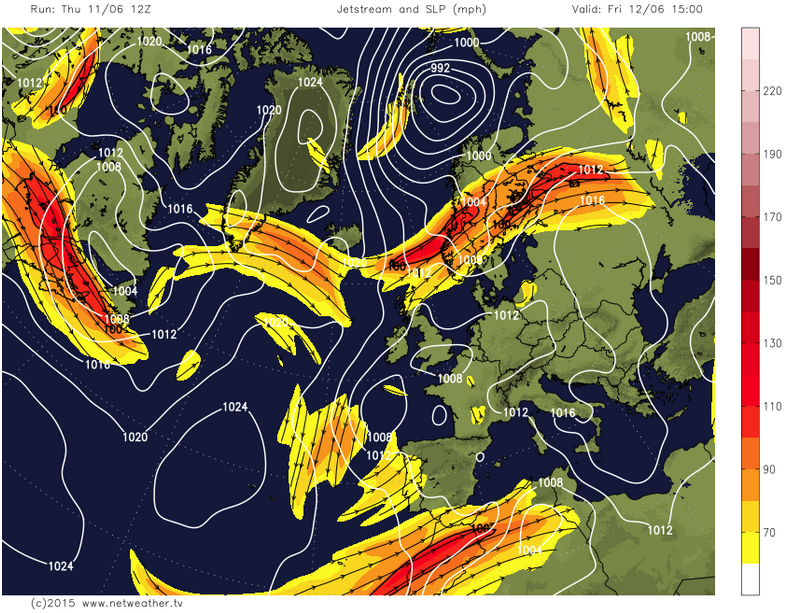 Heathrow Saturday unstable showery chart.. dry-ish mid level slot too? Of note is a dry slot at 700hPa mid levels (shown well on the chart below) that can induce evaporative cooling. Evaporative cooling is caused when moisture evaporates and reduces temperature. This reduced temperature at mid levels of the atmosphere can create higher CAPE as warm parcels excitedly find themselves rising through ever cooler environmental air. If sunshine heats the surface this can promote heavy showers and possible thunderstorms, albeit scattered and only a slight risk today. In addition a weak jetstream moves to a position later pm where any showers will find themselves on the left-exit region of the jetstream.. this is area known to further lift air from the surface, like a hoover dragging air upwards into divergent air aloft. The forecast is for scattered showers, some thundery later. So, as usual, some places could miss them though it’s a moist air flow so some rain is likely most places. Rainfall totals will vary between almost nothing to possible >10mm. Sunday looks cloudy but mostly dry as showers clear off tonight. 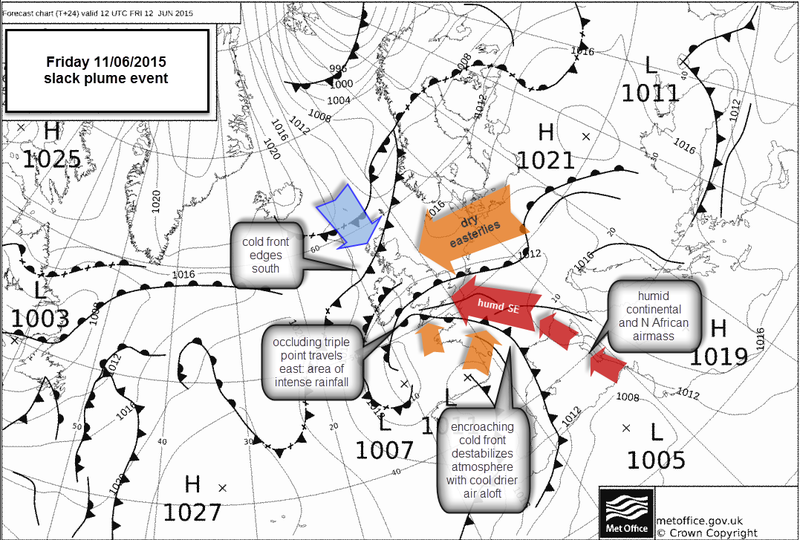 Next week and towards the end of June there is a threat of more rain, possibly pretty heavy on Monday as Atlantic LOWS nibble away at the Azores high that has dominated our weather recently. Monday sees a frontal wave low sticking wet conditions across the south which could yield high rain totals. Thereafter, mid week sees the Azores HIGH ridging back in with pleasant warm and dry conditions but this looks temporary as Atlantic LOWS nibble away with wetter westerlies always trying to edge back in. 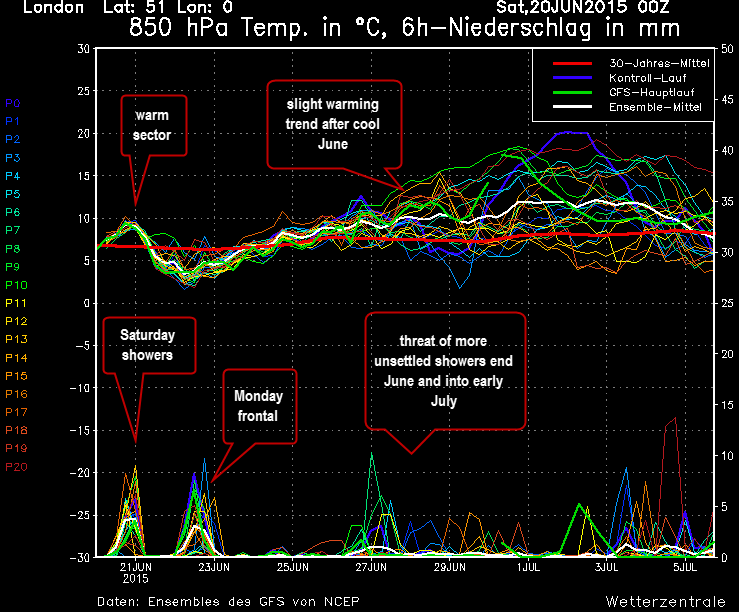 brief hot spell to start July? Review: In the event: this was largely a fizzle! Few thunderstorms emerged until later and the SW missed out completely, which was the favoured area for action by some forecasts. One or two heavy tstorms impacted Sussex / Kent and East Anglia later in the day and into evening. Surrey largely missed out, probably due to too much cloud cover, which left insufficient surface based heating to trigger home grown storms. Also, a lack of soil moisture is significant too and humidity was left crashing by the afternoon. Tmax Reigate barely scraped 25C here and, at 18C, dew points were on the low side all day, with RH similarly unimpressive hovering as low as 67% for a good while. Imported storms attempting to cross the Channel generally couldn’t make it and, those that did, clipped Kent and Sussex late in the evening. An interesting local convergence line in the evening popped up convection late on but this was mostly not thundery and missed Reigate anyway. This was always forecast as an isolated tstorm event and heavy showers did occur but nothing of note over Reigate. Many forecasts were found wanting and many convective storm specialists and enthusiasts will probably be smarting over this partial non-event. Possibly the biggest “miss” in forecasting for a number of years. In reviewing the charts below it’s worth noting that the individual ingredients were modelled but did not come together on this occasion and others were not solid: GFS CAPE and dew points significantly lowered in runs prior to the event. There was little wind shear to drive storms along in a very slack flow. It wasn’t a classic Spanish flow from the SSW – drier easterlies dominated. Finally, the initial flurry of Channel storms left a good deal of cloud clag across the region and did not permit surface heating. 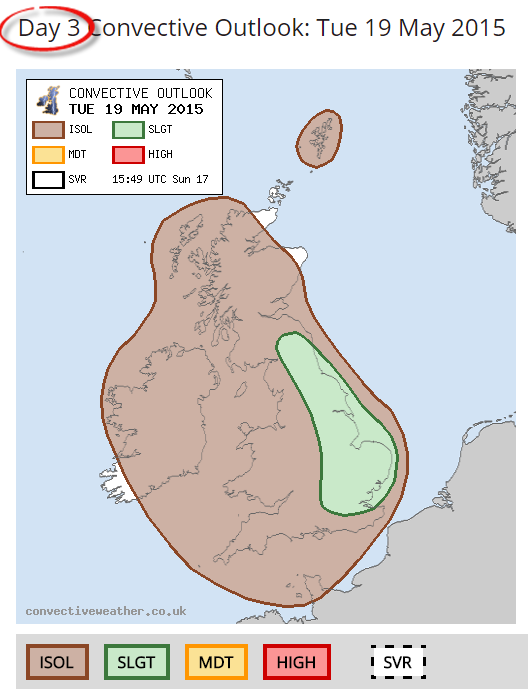 Southern England, including Reigate, is likely to have a first proper convective event of the year tomorrow including moderate to possibly even severe isolated storms with some heavy rain in a short space of time and a chance of hail, thunder and lightning. Not everywhere will get a storm but, if you do, it could be a pretty big one. For us in Reigate thunderstorms are most likely towards the afternoon and into Friday evening, though they could “pop” almost anytime during the day, especially if it is sunny and heat builds early. If it stays cloudy through the morning the set-up could fizzle out spectacularly! Expert convective forecasters say that this is a highly complex situation and forecasts, even at this late stage, are prone to inaccuracy when pinning down potential storms like these. This post is not a forecast but outlines some key ingredients for thunderstorms and sees how tomorrow is set up to deliver the goods, at least some of them. A MetOffice weather warning has been issued because the rain or hail could be heavy in a short space of time and cause local flooding and some disruption. The worst conditions are not expected here but further to the SW and S Wales. Severe thunderstorms have been occurring in France and Spain all day and, indeed across S Europe for much of the week, ours will be pretty moderate by comparison. Thunderstorms need 3 things to get them going: moisture, heat and lift. Here’s a quick review of some of these ingredients thrown into the Reigate and Surrey weather mix tomorrow with some charts to illustrate. You may have noticed that today warmed up considerably reaching nearly 25C in Reigate . Tomorrow will be warmer still. This is due to a warm “plume” of air arriving from the continent, from as far away as S France, Spain and the Mediterranean. where are you all coming from? 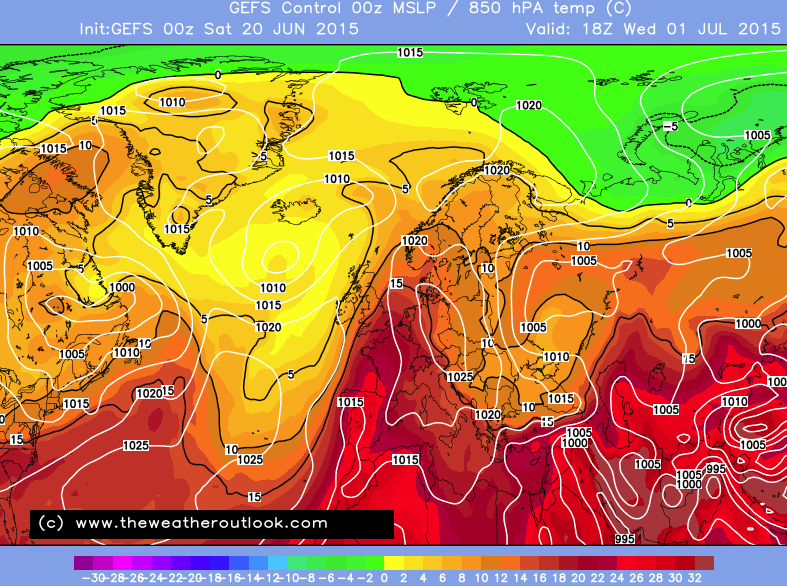 This imported heat alone will raise the “airmass” temperature to over 15C at 850hPa (1500m). Any sunshine, of course, will further heat the surface and this could raise temperatures on the ground to over 25C. This is a critical ingredient for thunderstorms: air needs to be warmed so that it will rise into the atmosphere. In conditions of potential severe weather it is useful to have sunhsine to heat the surface. The cloud cover tomorrow looks broken and, if it remains like that through the morning, this will build bigger afternoon storms. Whilst heat at the surface is a good thing to create warm rising bubbles of air, a comparatively cooler atmosphere through which the warm parcels of air can rise, is also a useful ingredient. The air high up is unusually cool at the moment and this will create steep lapse rates… a rapid reduction of temperature with height. Lapse rates can be shown on charts like below and on skew-t diagrams: these look tricky but show a cross-section through the atmosphere. Steep lapse rates encourage warm parcels to stay warmer than the surrounding air.. so they will keep rising creating tall clouds such as cumulonimbus. It’s also useful to have droplets freeze at the top of clouds: it’s these ice particles that bounce around through the cloud, rising and falling to build a charge that causes lightning. The red line is the “environment” air temperature: imagine taking the temperature of the air at regular heights as you rise up on a balloon flight: you’d expect the temperature to go down… usually by about 0.6C per 100m. Now consider how a warm rising air parcel will rise, expand (as less pressure), cool and condense at a different rate: this is the dashed line which shows how rising parcels sometimes stay warmer (tomorrow) than the environmental air right the way to the top of the chart at some 30,000 feet. So long as the rising parcel stays warmer relative to its surrounding then it will rise! The ultimate height of some well developed cumulonimbus clouds exceed 10km. Freely rising bubbles of warm air (thermals) is known as an “unstable atmosphere”: like heating soup on the hob.. bubbles rise through it. The Channel is only 12-13C sea surface temperature at the moment and this can subdue thunderstorms attempting to cross from France. Nevertheless, storms currently approaching the south coast are pretty active still but are not expected to reach far inland to the SE as pressure is still comparatively high. Without moisture there will be no clouds and certainly no thunder. The humidity and high dew points on the charts above shows how tomorrow there is plenty of moisture being advected into the country on the humid plume after the warm front passes north. theta e charts show airmasses well; spot the plume! The synoptic chart shows the warm moist wedge that is due to pass over the UK tomorrow; it has large quantities of precipitable water (over 30mm) which could fall all at once in the right conditions. Water vapour is a key ingredient: as water vapour condenses it releases latent heat which can drive upward lift in thunderclouds yet further (saturated air cools less slowly, so increases instability). Lift can be any forcing mechanism that encourages air upward. Surface based heating (diurnal heating) is important tomorrow, but so are fronts. An advancing cold front sometimes cools and dries out the upper atmosphere and this can increase lapse rates dramatically and encourage further lift. Charts showing CAPE (convective available potential energy) and lifted index can both show the tendency for air to lift. Higher CAPE numbers are good, negative Lifted Index numbers are good for storms too. LOW pressure is also important to encourage the mass ascent of air. 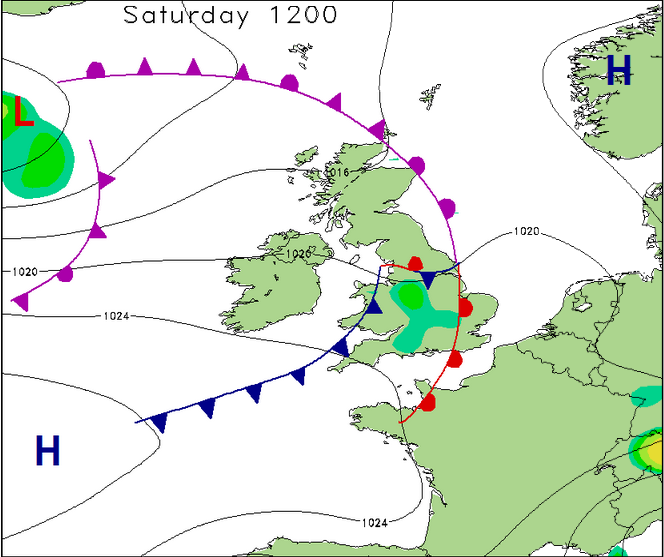 An upper ridge early tomorrow could inhibit thunderstorm development in the SE until the trough arrives later. A further source of lift is surface convergence of airflow. Convergence is where air arrives in a location quicker than it leaves. When surface winds converge air “piles up” at a location and has nowhere to go except UP. Surface convergence, with divergence aloft, is a good set up for lifting. Sometimes hills or coastal breezes can cause convergence and enhance lift too. For the very biggest storms more of all the above is good. Moderate storms and isolated severe storms might arise but there is a lack of wind shear to organise storms into supercells. Wind shear is increasing wind speed or change in direction with height. Tomorrow is a slack flow until a moderate jetstream appears later in the evening. 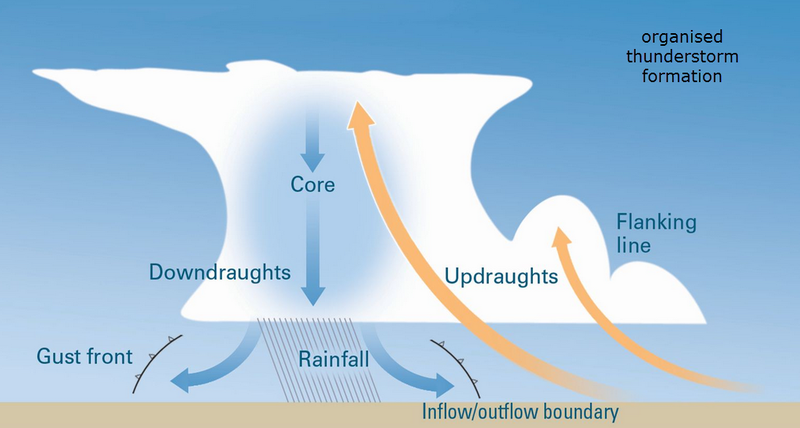 Wind shear has the effect of hoovering air up from the surface and separating the warm storm inflow from the cold outflow. An organised storm will thus keep hoovering up warm air which feeds further development into a severe storm or supercell (which starts rotating and is a precursor of tornadoes). With little wind shear the inflow feeding the storm can be disrupted and stopped by cold air descending from the tops of thunderclouds and cutting off their heat supply. Such storms die naturally after a few hours and are known as single cell storms. Multicell, supercell or meso-scale convective systems (MCS) require some shear to keep them strong and well fed. 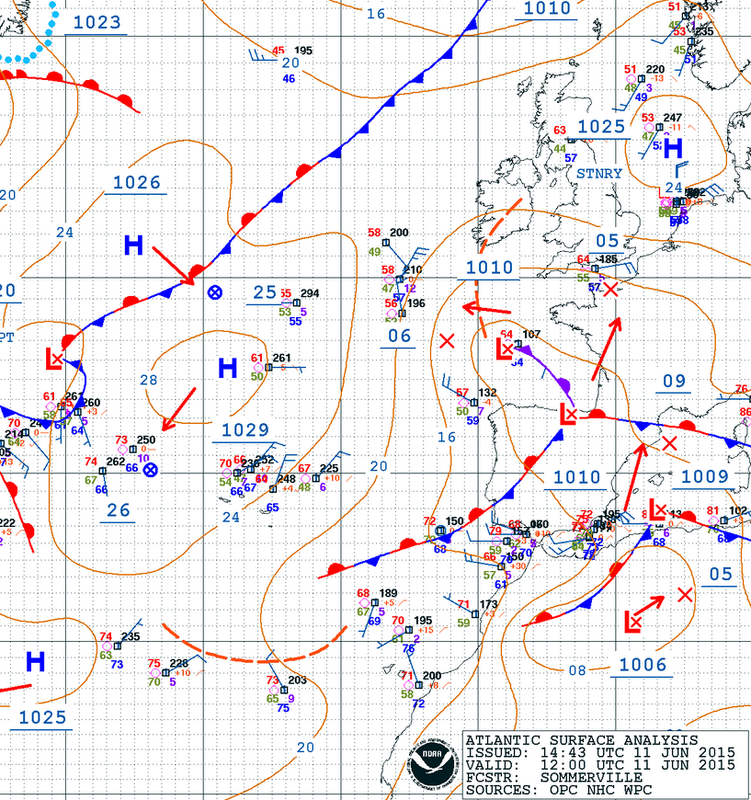 The lack of isobars on the synoptic surface pressure chart below indicatea the slack flow. This can cause high rainfall totals because storms sit and soak the same place rather than move on. The overall synoptic development of this plume shown below is good-to-go for storm action tomorrow for some places in the south and SE including Reigate. A separate article discusses Spanish Plume development here. 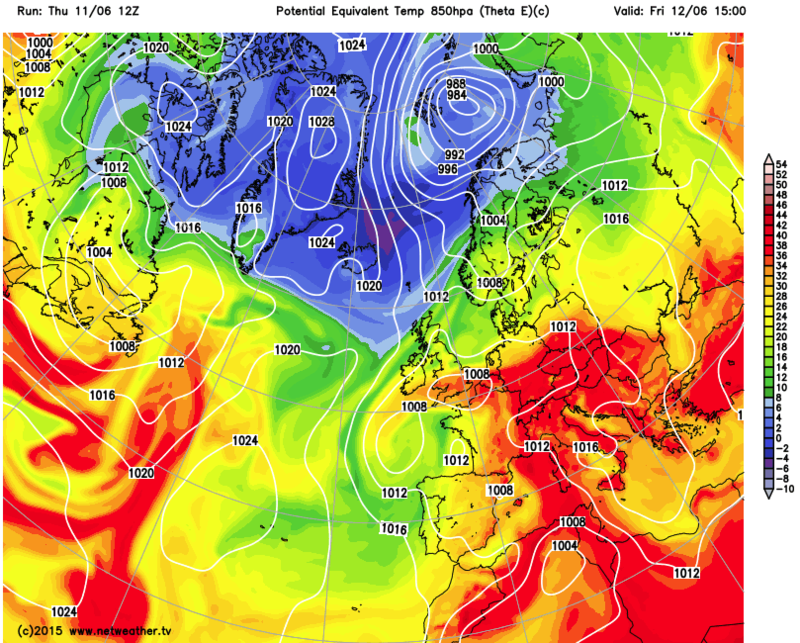 Heat: strong advection of very warm humid air across southern England. Low pressure: allows air to rise on mass. Moisture: humid air across the south throughout the day. Lift: sunshine will hopefully lift temperatures and permit thermals to rise to develop home-grown storms later in the day. Do watch out for the King of Clouds… cumulonimbus or any of the development clouds like altostratus castellanus, and share pics and stories of any storms that come your way. Meanwhile,check professional forecasts for updates of course if you are making decisions. Note: this is not an expert convection article, but an educational outline of storm formation. Comments always welcome. May 19 thundery showers was not a “severe” weather day but 10mm of rain from 7 showers in 7 hours, several with some moderately intense rainfall rate (30-40mm/hr), small hail and episodes of thunder, was of interest locally and deserves a review of some charts leading up to the event. Often our area of the SE seems to miss convective action but this time showers perked up as they converged across East Surrey and some developed into reasonably impressive cumulonimbus clouds (cb). As a bonus mammatus clouds were spotted at the end of the day (see photo above). Below is a summary of some key ingredients for the day. Low pressure: This synoptic set-up saw an unusually cold plunge of upper air flood across the country during May18-19. 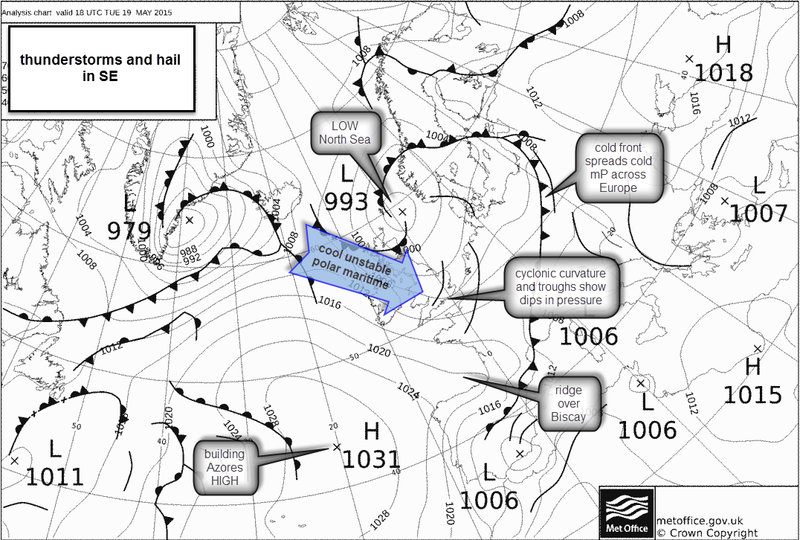 The synoptic chart above shows the invasion of cold polar maritime air behind a cold front, itself not especially dynamic across the SE. The LOW over the North Sea dragged this unseasonably cool air from the NW: the basic ingredient for instability on this occasion. 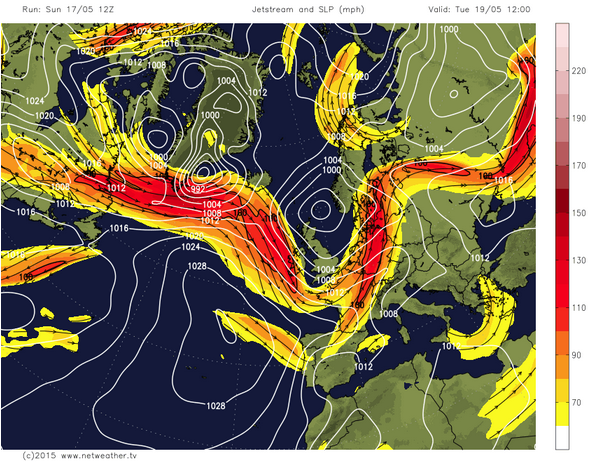 Note the u-bend wiggle in the jetstream around the LOW pressure in the chart above. The northward limb of the jet on the inside of the U-bend can become the location for instability, though this was not a fast jetstreak occurrence. 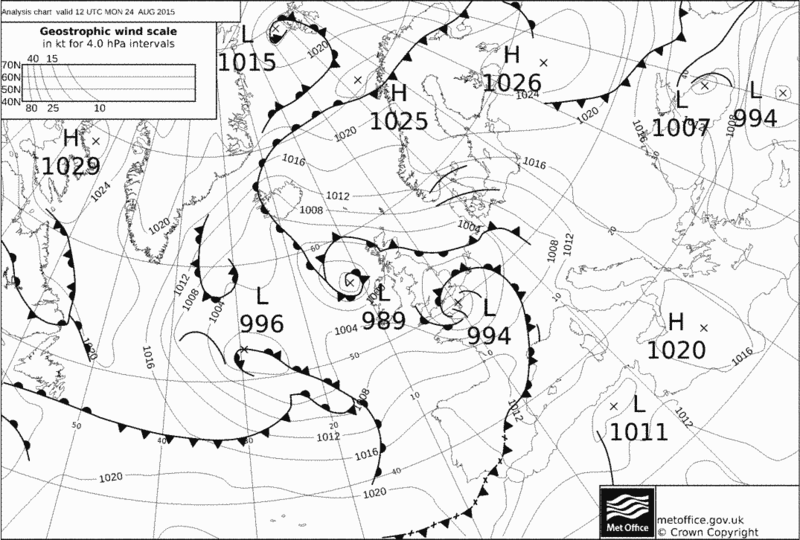 The base of the trough also crossed the SE of the UK during the day encouraging lift. Showers were forecast on the charts days before. Steep lapse rates: Very cold upper air temperatures fell to below -30C at 500hPa (5500m) across the UK. In Spring a cold airmass like this can become unstable over land especially if the sun warms the surface to create thermals of warm air able to lift through the cold environmental air. The 850hPa temperatures show comparatively warm air at 1500m which increases the lapse rate. The morning of May 19 was sunny and the surface heated with 5 hours of May sunshine to a modest 14C, just enough to release thermals and rising parcels of air. Convection requires heat as a key ingredient to steepen lapse rates and create thermals, rising parcels of air. 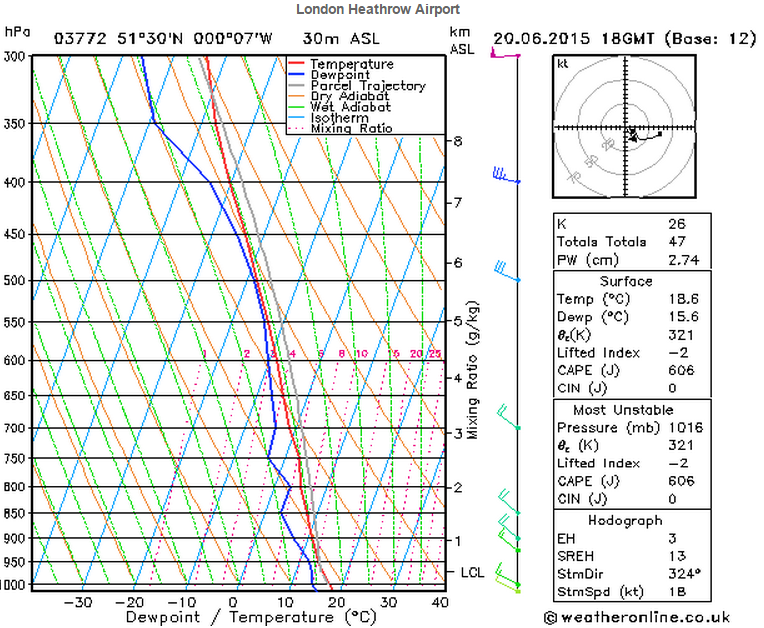 Low lifted index: LI forecast for Heathrow (below) showed a LI of -3. The lifted index is a measure of instability in the atmosphere and shows how readily bubbles of warmed air will rise from the surface to a great height (convection). It is the difference in temperature between the environmental air at 500mb level (around 5500m) and the temperature of the theoretically lifted bubble of air (parcel). Moderate CAPE: convective available potential energy is the energy available to push air vertically up and create those surging bubbles of cumulonimbus clouds. The higher the CAPE the greater uplift potential (above). Note it is potential energy and a high CAPE often confounds convective activity if other ingredients are lacking, such as heat or moisture. 19 May had marginally unstable values for the UK of 800j/kg. 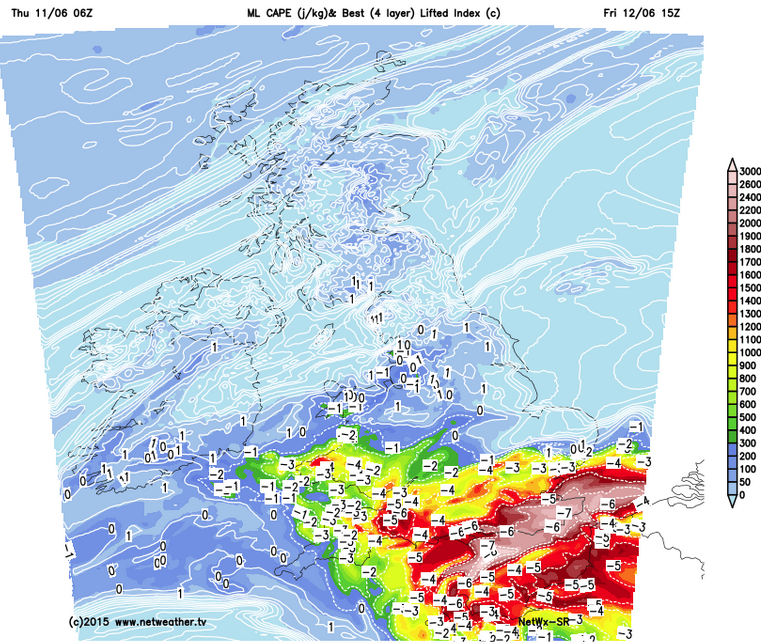 The colourful charts above from lightningwizard.com show streamlines of wind and air mass equivalent potential temperature. Streamlines show where the airmass is coming from and, if they converge at the surface, can indicate potential for lift. Theta e charts show moisture and temperature characteristics of airmasses. Where there is a contrast of colours between high theta e and convergence at the surface and lower values and divergence of air at altitude this can bring on convective weather. The moisture chart shows that the airmass supplied sufficient moisture to the UK to provide for cloud formation and release latent heat. Dew points stayed relatively low and this showed moisture (and heat) locally was lacking for bigger storms. Compare these forecast charts with the actual occurrence of lightning on the day. 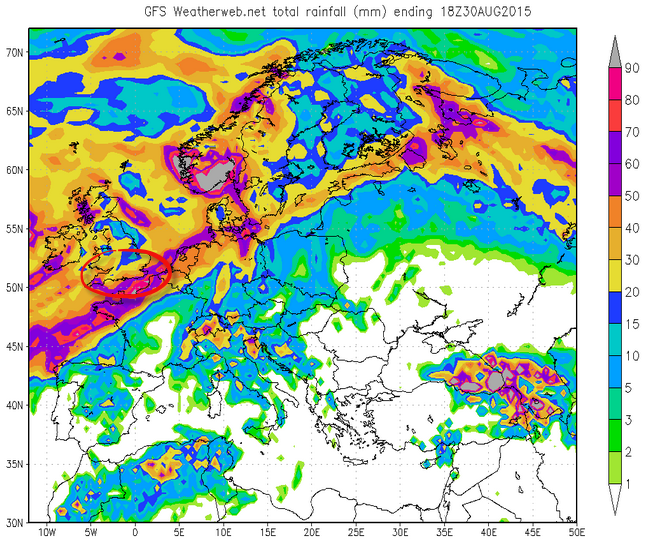 Forecasts for the day (Euro4) showed typical lines of rainfall accumulation which indicate showers. The actual radar showed “popcorn convection” (@metmanjames) over a wide area drifting east. Recommend following @convectivewx for UK convective forecasts. Their forecast from 3 days ahead was spot on. Potentially interesting, albeit tricky, weather tomorrow for UK, Wednesday. A deep surface LOW sits to the SW of Ireland and is dragging through complex series of fronts associated with various airmasses. Occluded fronts are tightly wrapped around the LOW, which is due to migrate NE away from the UK during the weekend and pressure to rise. For the SE tomorrow it’s not so much the fronts but an unstable mass of warm southerly surface air that will be the main cause of any heavy showers tomorrow and some potentially thundery weather, especially when this warm air is forced up by anything… coast, hills or fronts. Here’s likely scenario for us in Reigate, Surrey SE: Rain is likely, possibly exceeding 10mm, which is fairly wet for SE: higher is possible. Most of this is likely to be convective rainfall due to unstable and moist air moving in from the south overnight. Showers, possibly heavy and thundery, are most likely in the morning as the warm surface air moves into our area, causing lapse rates to increase moderately and this encourages lift and cumuliform clouds. If the sun comes out then surface heating could spark heavy showers and thunderstorms as warm air rises freely through the atmosphere, encouraged by the jetstream overhead that effectively drags air off the ground. One of the ingredients for thunderstorms, LIFT, is therefore partly in place tomorrow, although it will depend on sunshine for greatest effect. If it stays overcast, which is possible, then little exciting weather action beyond just rain is likely. The above charts also show that the southerly / SW airstream is humid because, as it converges on the coast, the model shows rainfall increasing significantly. This increased rainfall on coasts is often caused by convergence which is due to air arriving onto the coast quicker than it is leaving (check the lower wind speeds inland) so the wind effectively PILES UP on the coast and is forced to rise as it has nowhere else to go except UP! This is called convergence. It is clear from the charts above that any HILLS also encourage lift as South Wales and even the South and North Downs appear to be pushing rainfall totals up locally: this is orographic or relief rainfall. The charts below shows another feature of the weather tomorrow: the winds are shown to be VEERING with height (left diag) which allows WARM air to advect (move into) into our region (right diag). 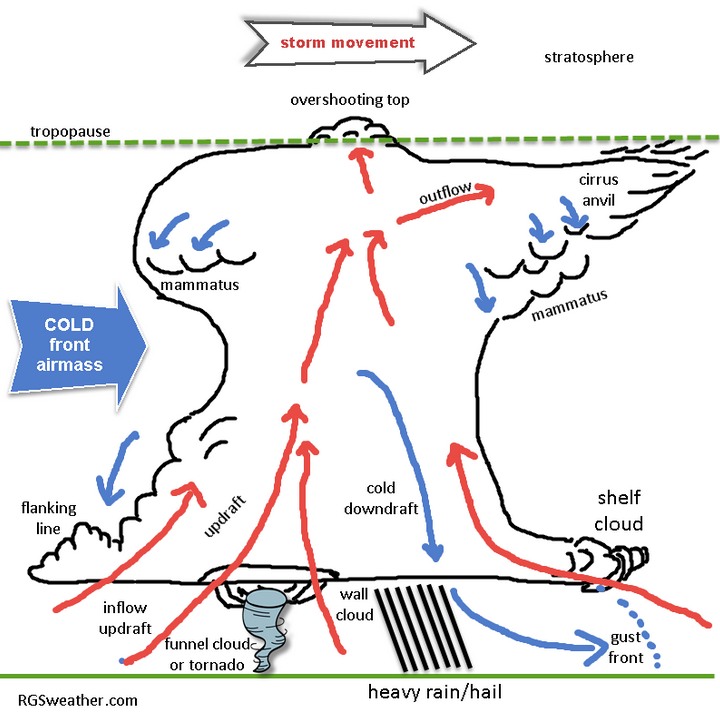 Read on for more about how veering winds and WARM AIR ADVECTION can encourage stormy weather. Another ingredient for potentially unstable weather is that winds are VEERING tomorrow, albeit not dramatically, which means they are rotating clockwise directionally with height thus allowing warmer air from the south to move into a location: it is like opening the door to warm air: winds move through a southerly direction and therefore allow warm air to “advect” into our area. A moderate wind veer is taking place overnight and into tomorrow morning. Warmer air at the surface is overrun by cooler westerlies aloft that increases lapse rates: steepens the temperature difference between surface and air at altitude. The air at altitude tends to stay the same temperature and is associated more with direction and origin of airmass than it is with surface heating or advection of warmer air at the surface. An increase in lapse rates adds to instability which encourages air parcels to LIFT off the ground, should surface heating occur if the sun comes out. 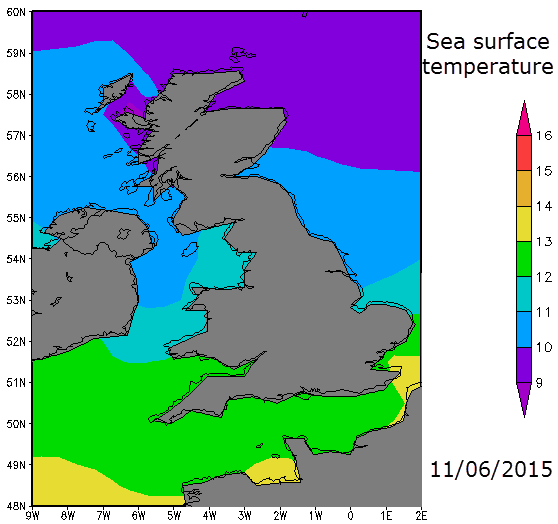 The chart above right shows how WARM air is ADVECTED into the South of the UK and migrates NORTH during the day. This has nothing to do with solar heating… it is an 850hPa chart (1500m) and shows the airmass temperature which is largely independent of surface influences. It’s a good example of WARM AIR ADVECTION with a moist air stream increasing instability causing showers and possible thunderstorms. Finally, the warm relatively unstable airmass is being overridden by a NE turning jetstream that will encourages lift and wind shear. Wind shear is the vertical change of direction and/or speed with height: rotation. Shear is moderate tomorrow which might also add a twist to rising air that could even produce the odd tornado. Nice 🙂 After writing this Estofex issued a tornado warning Level 1. There is some interesting weather potential this week, but indications that the SE will see least of any drama which will be mostly further west. The well-established warm plume of S/SE wind from Africa/ Mediterranean and Spain has brought temps up to 19.4c in Reigate this weekend and 20c in London. A warm sunny Saturday was especially pleasant. The breezy S/SE wind is bringing Saharan dust falling over the UK, watch for this in any showers that might come our way on Monday. Check your car for any dust. Warm plumes from Spain can also introduce unstable moist air and these produce thunderstorms and showers when moist warm air converges or fronts undercut the plume with Atlantic air creating lift. There is good potential for heavy convective downpours of rain this week due to these scenarios. 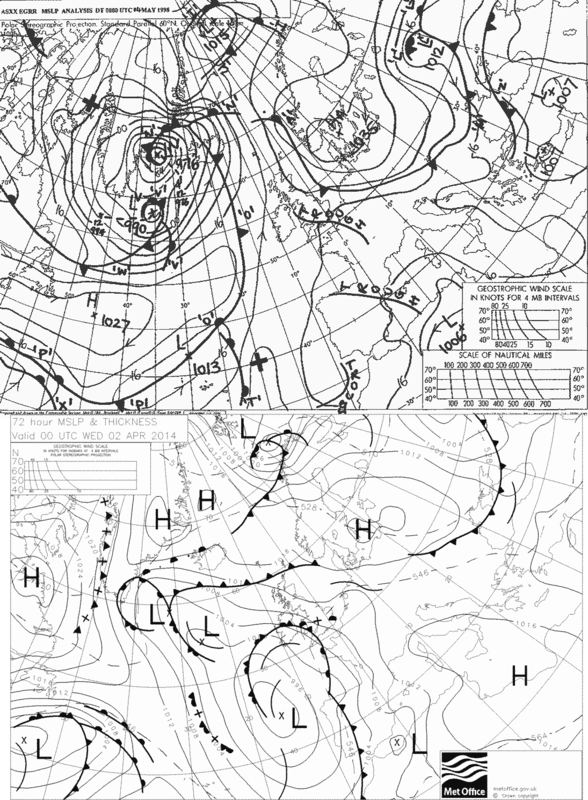 Whilst not necessarily a classic Spanish Plume the synoptic situation is very similar to May 1998 when large super-cell thunderstorms drifted to the North and caused torrential rain and flooding in parts of the North. Various indicators are used to establish the potential for heavy convectional rain and thunderstorms. At times the charts show several of these indicators at unsually high levels for end of March / early April this week. CAPE (convective available potential energy), LI (lifted index) and ThetaE (potential equivalent temperature) … these are all technical charts that are commonly used to assess how likely thunderstorms will be. ThetaE rarely goes above 19c in the UK so temps of +12c in April are unusual so early. Unfortunately, the development of convective rainfall and thunderstorms is difficult for forecasters to predict for any one location for a particular time. Thunderstorms and showers are, by nature, hit and miss affairs: one place might get large hail and a deluge while, a mile down the road might remain sunny and dry. Nevertheless, watch out for some potentially heavy rain, especially if travelling this week. Watch out for interesting cumulonimbus clouds too! Total rainfall remains highest in the west and away from the SE where pressure remains higher and frontal action is more limited. So Reigate may escape the worst of all this convective rain action but still worth keeping an eye out for rogue storms that may well come our way drifting most likely from storms in the Channel around mid-week. 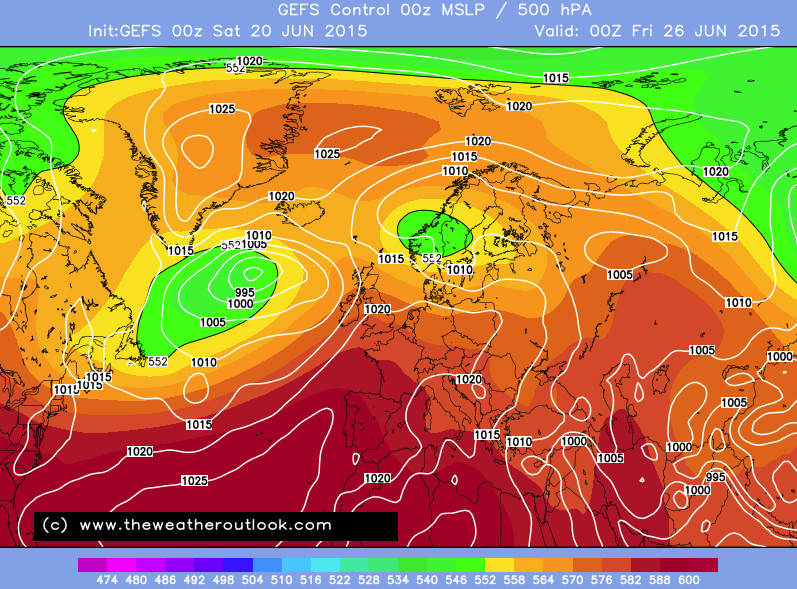 Finally, models are hinting at high pressure building back in for the school holidays after this wet unsettled week. Whilst not yet represented on charts very convincingly, the models suggest a possibility of some reasonable holiday weather in the UK with pressure rising and temps above the 30 year average on the GFS ensemble mean. Recent storms: “Tornadoes in Surrey”: genuine rotation or media spin? In Reigate we recorded our maximum wind gust for at least 4 years of 52mph during the passage of the active “squall line” cold front at 5pm on Saturday 25 Jan. Biggin Hill recorded 68mph and Kenley 60mph peak gusts. For Reigate 52mph exceeded StJude 2013 and the storms in December, however the duration of the January 25 gusty front was barely 10 minutes. The weather phenomenon that produced this extreme short-lived gustiness is called a squall line. Below is the 500hPa chart for temperatures at 5000m and the 850hPa chart (1500m) as the storm passed over Reigate and SE England. Note the dramatic change in air mass temperature (colour) and pressure at height either side of the front, especially in the SE. A squall line is a very active cold front. This one migrated steadily from the NW to the SE during the course of the day (see radar pics above) causing electric storms across the Midlands and some unconfirmed tornadic activity reported there too. The squall line appeared to break up a little on its passage down towards the SE but still caused significant gusts measured between 50-60mph. The experience of fierce winds “coming out of nowhere” combined with lashing rain or hail impeding movement, causing tree branches to sway or snap alarmingly and even whole trees or garden walls and sheds to blow over in an instant, followed by power cuts in some areas locally, have all understandably prompted the search for explanations. “Mini-tornadoes” have been mentioned in the media as a possible cause for this weather phenomenon. So, was Surrey struck by a “mini-tornado” on Saturday January 25? This post looks at some local evidence and puts forward a round-up of what is “required” before weather phenomenon can usually be labelled a tornado. It is worth mentioning that there is not really any meteorological phenomenon formally known as a “mini-tornado”. Whilst spinning vortices of air can vary greatly in size and shape (e.g. vortices of rubbish on a street corner, dust devils, land /water spouts and gustnadoes) and can yield a great range of wind speeds, a “proper” tornado is only formally defined as a violently rotating column of air, in contact with the ground, usually underneath a cumulonimbus cloud and usually (but not always) visible as a funnel cloud that is intense enough to do damage. So there is no such thing as a “mini-tornado”. Wind speeds in tornadoes are unknown. This is because traditional anemometers are destroyed even in weaker rotations. It is suspected that wind speeds can exceed 200mph and even 300mph in larger Mid West tornadoes. From evidence seen so far, few local eye-witness accounts from 25 January have revealed any reliable sightings of funnels or convincing sustained surface wind rotation and there are no photos of funnels or vortices, which isn’t surprising given the lashing rain and bad weather and gathering gloom at 5pm! Any formal tornado identification must therefore rely on gathering evidence of damage and analysis of the prevailing conditions. To get nearer an answer we must see how close recent events came to satisfying tornado producing conditions and whether any damage evidence points to tornadic activity in and around Reigate / Surrey area. Tornado formation is a big topic so these are necessarily abbreviated explanations but they are a starting point from which we might be ready to observe and record tornadic activity even better the next time! 1.Were conditions conducive to tornado formation? Yes, partly! Tornadoes are associated with severe thunderstorms. The biggest tornadoes are produced by storms called super-cells. These are rare in the UK but relatively common in the Mid-West of the USA where about 1000 tornadoes occur every year usually in spring/early summer and autumn. Thunderstorms are produced when moist humid air is rapidly lifted from the surface and huge amounts of water vapour condenses to form towering clouds called cumulonimbus. Latent heat is released which drives further lift and draws in further warm moist air in a feedback loop which builds cloud height. Cb clouds form characteristic shapes like the ones below spotted in Reigate on 28 Jan 2013. The UK experiences around 30-40 tornadoes per year, so thunderstorms and squall lines like the Jan 25 event can certainly produce tornadoes, albeit weaker than the US Mid-West variety. An unstable atmosphere is a prerequisite for most thunderstorm formation. Instability is a condition where warm air rises and keeps rising until it hits an inversion layer or the top of the atmosphere, (itself an inversion layer called the tropopause) whichever is the lower. Inversions occur where temperatures increase with height, instead of the more usual decrease. An inversion will prevent thermals rising and any increase to cloud height will cease. In unstable conditions, warm bubbles of rising air (thermals) will expand with height, cool down and moisture will condense into water droplets creating the bubbly explosive cloud formations that can be seen growing at the top of young thunder clouds (“Turkey towers”). Skew-T graphs show temperature change with height. The graphs below show recently unstable conditions in Reigate during a period of thundery activity and the passage of the squall line in Nottingham on 25 Jan. Note the relatively steep “lapse rates” shown where temperatures fall rapidly with height. Steep lapse rates are a critical ingredient for thunderstorm development. Steep lapse rates allow convective thermals of rising air to lift rapidly. US tornadic thunderstorms in the mid-west often have an additional atmospheric feature called a “cap” that “turbo-charges” thunderstorm development. 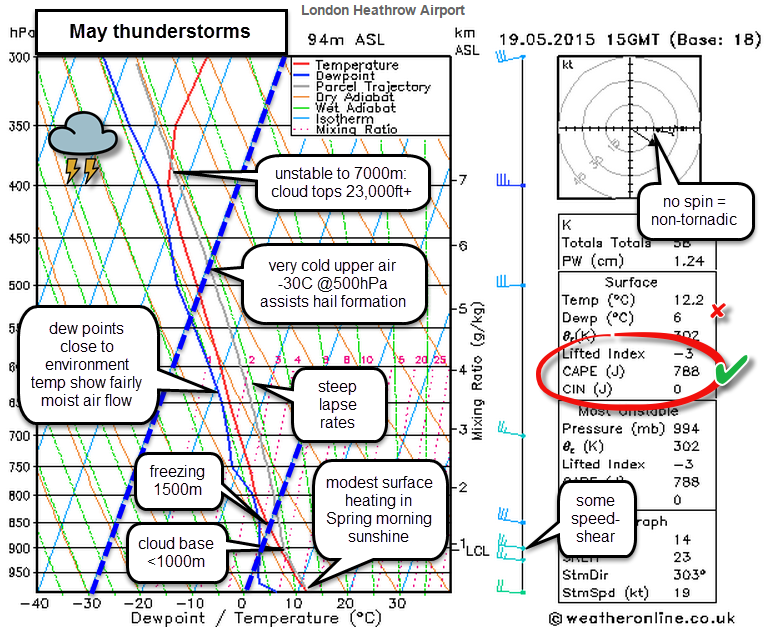 A “cap” is an extreme temperature inversion created by a warm dry wind aloft that prevents further uplift of thermals until energy at the surface has built sufficiently for thermals to “bust through the cap” and rise unabated, building explosive thunderstorms extremely rapidly. There is no evidence of an inversion cap on the 25 Jan squall line. The movie below shows how violent super-cells erupted after the cap has been broken last year over El Reno, OK, USA, producing one of the most violent tornadoes ever recorded. Another essential process in the production of tornadoes is rotation. Air can start to rotate in a thunderstorm due to changes in wind speed and/or direction with height. This is called wind shear and it is an essential ingredient in creating severe tornadoes. A twisting motion in rising air masses can be the result of winds from different directions meeting and “rolling” the air into a horizontal sausage. Try rolling a pencil between your hands moving them in different directions… this is essentially what winds from different directions can do to the air. Note the absence of directional wind shear in the Nottingham Skew-T chart during the passage of the squall line: all the winds at different heights were blowing in much the same direction. There appears to have been some vertical speed shear. Nevertheless, the absence of directional shear seems to reduce the chances that this storm was a tornado producer. Clouds can show evidence of rotation in the atmosphere: shelf clouds (horizontal rotation, rarely produce tornadoes directly), wall clouds (vertical rotation: often an imminent precursor to a tornado) and funnel clouds (visible tornado condensation funnel in early stages of development that has not yet “touched down”) are all signs of very disturbed rotating air that is a precursor to tornado activity on the ground. No evidence of distinctive wall clouds or shelf clouds or funnels has emerged from the Reigate storms 25 January. tell-tale severe weather… get indoors, or take a photo! Horizontally rolling air aloft can be twisted into a vertical spiraling vortex, a tornado, by strong warm updrafts of air in thunderstorms. Warm updrafts (thermals) can be lifted for various reasons. During the summer, heating of the surface can trigger thermals to rise and, in unstable conditions (where rising thermals keep rising as it is warmer than surrounding air), this can trigger thunderstorms. During the winter, with less sun available to heat the surface, warm air can still be forced off the surface by active fronts or extremely unstable and moist converging air masses. A coastline or range of hills might be sufficient to lift air to unstable levels and create thundery activity. 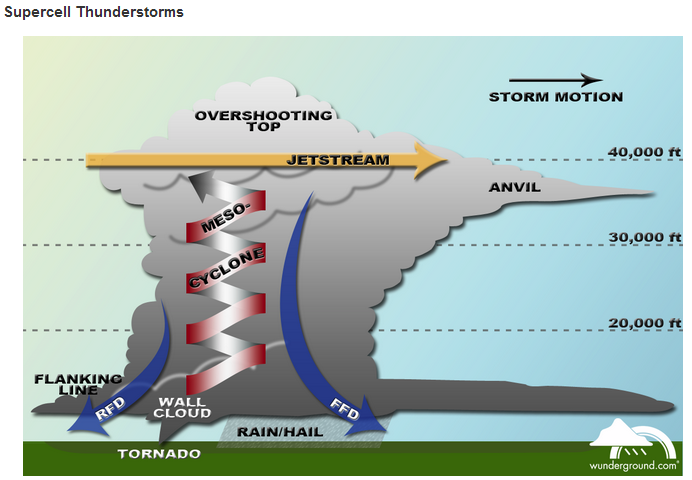 Once rotation is moved vertically through the storm then a tornado is possible given the continued updraft of warm air. Thunderstorms will decay if the cold downdraft of air created by heavy rain or hail interrupts or cuts off the rising warm inflow. This decay occurs in single cell thunderstorms that sit still over the same rising thermal source. To build a severe storm requires a strong wind shear and motion across the ground to separate warm inflow from cold downdrafts. Once this separation occurs then the storm engine can keep running and produce long lasting severe weather with a greater chance of tornadic activity. Although the squall line on 25 Jan did not produce super-cells it nevertheless provided lengthy displays of lightning and thunder, especially across the Midlands. descent of the funnel cloud to the ground. finally reaching a rope-like dissipation. 2. What do tornadoes look like in the UK and were any spotted during the 25 Jan event? Classic photos of US tornadoes do not help identification in the UK. Tornadoes in the UK tend to be smaller and short-lived. However, the appearance of a tornado is not a reliable indicator of its intensity. Some narrow rope tornadoes can contain extremely violent winds whilst wide established rotations might be weaker. In the UK tornadoes often initially appear as small funnel clouds, sometimes hard to spot, emerging from a lowering in the base of a cumulonimbus cloud ( a wall cloud). Funnels appear to drop from the cloud, though this is not really the case. The funnel is actually condensing water droplets progressively becoming visible at lower altitudes as pressure falls in rapidly rotating rising updrafts of air. The rotating air beneath a rotating thunderstorm remains invisible until pressure and humidity allows condensation to make it “appear”. It is possible to have an “invisible” tornado, for a period at least. The other reason funnels become increasingly visible is when they pick up dust and debris in their rotation. Funnel clouds are quite commonly observed in the UK but few “touch down”. Here is a selection of UK funnels and tornadoes. Unfortunately there were no similar sightings on 25 Jan so this reduces confidence in tornadic activity on this occasion. 3. Was any convincing tornado-like damage left behind? Despite the impressive trees knocked down, the damage type did not suggest a tornado. The type of damage can be conclusive in identifying tornado activity. The damage left behind by a tornado depends on the speed of vortex rotation, the duration and length of the path across the ground and the nature of the objects along the path. Severe storm meteorologists have a keen understanding of what kind of damage tornadoes do on the ground. 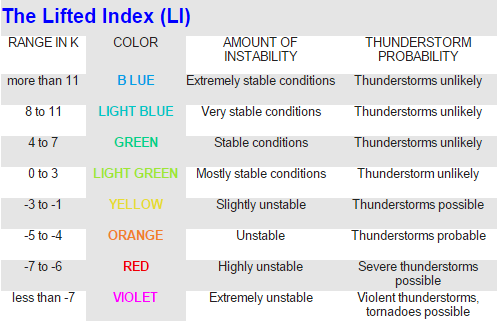 The US Enhanced Fujita scale and the UK based TORRO both estimate wind speed from the damage inflicted by tornado events. Meteorologists investigate possible tornado sites and assess the damage using these scales. When visiting WIND DAMAGE a diverging pattern of damage with several throw directions, with no clear path, perhaps moving out from a single point in several directions or otherwise isolated damage limited to single trees or blown objects is a good indication of straight line winds or downbursts (severe, but non-tornadic). To confirm a tornado the existence of a damaging circulation / evidence of rotation at the surface must be found before the event can legitimately be called a tornado. With tornado damage, destruction is generally along one direction or path, debris along the ground is twisted or has spiral characteristics, and often small arcs where the top-soil has been removed are visible. If such a confirmation cannot be made, the event must be considered to be either straight line winds, or possible a funnel cloud which did not touch-down or simply a “possible” tornado with no sighting. Damage in and around Reigate and Surrey from the 25 jan episode is not representative of tornado damage (see below). It is more likely that the damage below was caused by straight line winds and down drafts during the passage of the cold front. We have to agree with the Met Office conclusion from January 25th 2013 which was that “we have had a line of very intense thunderstorms with strong, squally winds today and it is possible that these conditions could have produced small tornadoes. We have had reports of small-scale events consistent with tornadoes but at this stage it’s mostly hearsay.” RGSweather would finally add that it is unlikely any damage around Surrey was caused by a tornado on this occasion. For reference: how to stay safe in tornadic conditions: for next time! Here is a selection of tornado clips showing the formation, typical examples and scale of damage and frightening experience that can occur in Mid-West tornadoes. 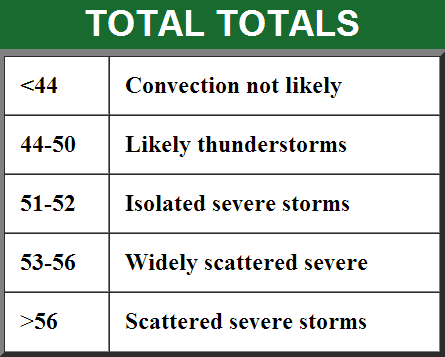 Total totals index: >60 can cause tornadoes! The conditions for lightning occur when powerful updrafts in cumulonimbus clouds force water droplets and ice crystals to rub against one another, creating massive amounts of positive- and negative-charged particles. The updrafts cause these two types of charged particles to separate, with the top of the thundercloud usually becoming positively charged as the lower part becomes negatively charged. Here are the ingredients which formed the heavy “April showers” and first thunderstorm (TS) of 2013 over Reigate on Friday afternoon, 12 April 2013. Whilst only a minor storm, it possibly still contributed to a multi-vehicle non-fatal accident on the M25, closure of the motorway for several hours, poor visibility, local flooding and hail across the area. Convective isolated rainfall events like these are important but tricky to forecast accurately: predicting exactly how much rain will fall, what type and precisely where and when isolated showers and thunderstorms will take place has a lower success rate than other elements of forecasting, like temperature predictions, for example. Here is a round-up of the key indicators that enabled @RGSweather to issue a forecast for possible thundery activity more than 4 days before and monitor it’s development thereafter and issue a local forecast warning of a thunderstorm risk with very marginal low level tornado risk on the morning of 12 April. A single relatively minor thunderstorm developed mid-afternoon with hail and lightning crossing north of Reigate on April 12, following a line roughly along the M25 between Leatherhead and Reigate. The morning saw scattered and heavy showers but little organised severe weather. 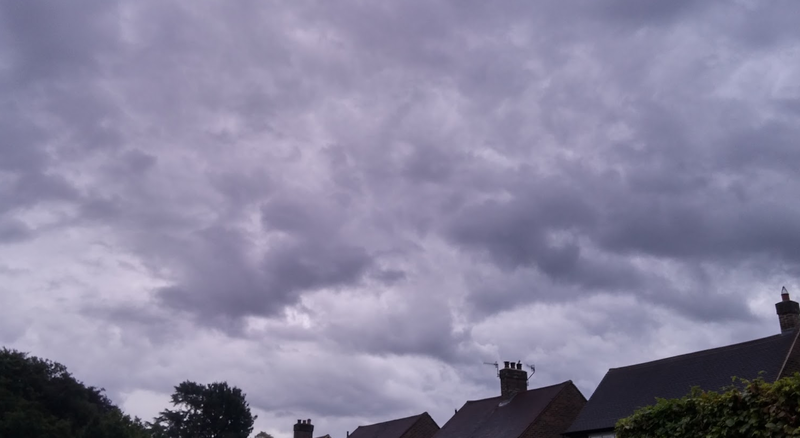 Skies darkened over Reigate by 3pm under thicker cumulonimbus cloud and this thunderstorm caused some hazardous driving conditions on the M25 and a non-fatal multi-vehicle accident coincided exactly with the time the storm passed over the M25 which was closed clockwise for several hours thereafter. LAPSE RATES: +29°C: Cold temperatures at 500mb heights and warming at the surface in the April sunshine caused steep LAPSE RATES of 29ºC. Lapse rates are the drop in temperature with height usually measured between 850hPa (1500m) and 500hPa (5000m). Steeper lapse rates indicate an unstable airmass where parcels of warm air heated at the surface in spring sunshine will rise rapidly and remain warmer than the environmental air surrounding them. Such air parcels will condense, releasing latent heat, which causes further rapid uplift and potential for the formation of cumulonimbus clouds given the absence of any inhibiting factors, like a cap (inversion or isothermal layer… see link below). CAPE and Lifted Index: 378j/kg; LI -1: Convective Available Potential Energy (CAPE) is a measure of the energy in the atmosphere for convection (j/kg). Figures in MidWest USA approaching 6000 j/kg cause tornadoes. 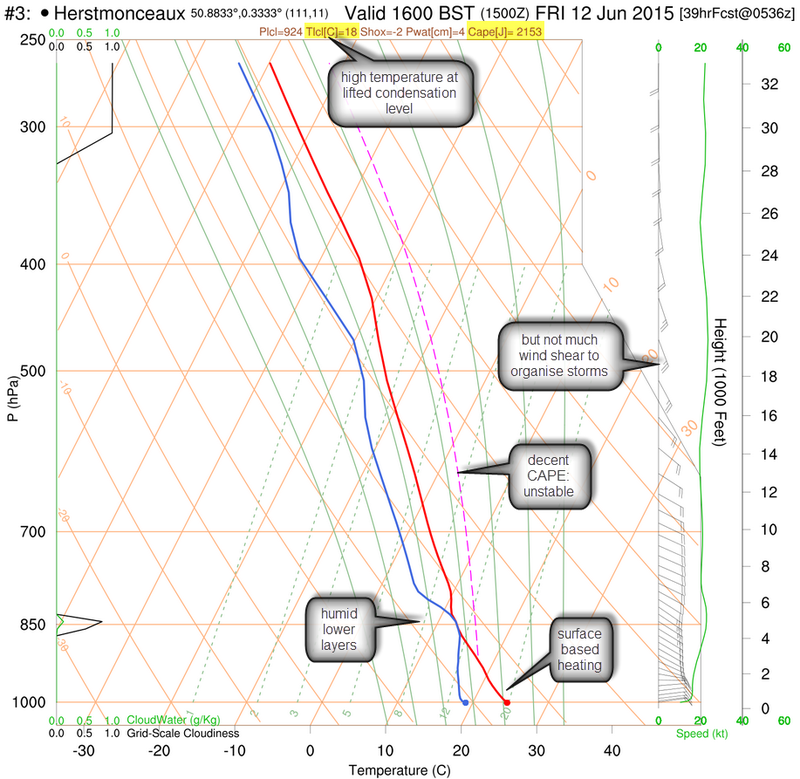 Here in the UK, CAPES above 300j/kg can cause thunderstorms. Lifted index is the difference in temperature between the environmental air at 500hPa and a parcel of air lifted to that height: a negative LI indicates buoyancy in rising air parcels and instability and significant convection. Vorticity at 700hPa: upper air velocity at mid levels means that air is rising. April 12 has UVV: upwardly mobile air at mid-levels. PWAT: 20mm: Precipitable water is the amount of water that would fall to the surface if all the moisture in the atmopshere rained or hailed out. Relative humidity is a measure of how saturated the air is at various levels in the atmosphere. 100% means saturated: most levels were at least 80% RH. Total Totals Index (TTI): 60: this is a forecasting index used to measure potential storm strength. It is calculated using the difference in dew point and temperature between 850hPa (1500m) and 500hPa (5000m). TTI’s in the MidWest of >60 can yield severe tornadic supercells. Wind shear: this means change in speed and direction of winds with height. April 12 saw little deep layer wind shear: winds were blowing at similar strength and direction throughout the atmosphere so little rotation or organisation into severe storms could develop. Nevertheless, slow moving storms deposited a lot of rain locally and caused minor localised flooding. WAA: warm air advection: introduction of warm air at the surface increases lapse rates and can increase likelihood of severe TS: 12 April saw little WAA and this inhibited the development of any organised severe weather. Towards the evening warmer air moved in aloft and, along with the removal of surface heating as the sun set, rapidly reduced lapse rates and inhibited convection causing towering cumulus clouds to melt away leaving a clear night. So, several ingredients were present to create a marginal storm risk but the absence of some other critical factors like WAA and wind shear kept a lid on the severity and distribution of thundery activity yesterday. Hopefully, this brief round-up of key storm indices relevant for SE England should help in predicting more severe weather in our region in the future. Tornado Titans posted this on the CAP and skew-t charts. v helpful. If this is all too much then watch this instead…!